Here's a look at everything this weekend has in store, from snow and ice totals to projected road conditions. * WHAT...Mixed precipitation expected. A wintry mix late tonight into Saturday morning. Some ice accumulations are possible. * WHERE...Portions of North Central Iowa. * WHEN...From 3 AM to 10 AM CST Saturday. * ADDITIONAL DETAILS...Plan on the potential for icy roads and walkways prior to warmer air arriving mid to late Saturday morning. * WHAT...Mixed precipitation expected. Total snow accumulations of 1 to 3 inches and ice accumulations of up to one tenth of an inch expected. Winds gusting as high as 35 mph. * WHEN...From 6 AM CST Saturday to 1 PM CDT Sunday. * ADDITIONAL DETAILS...Plan on slippery road conditions. Patchy blowing snow is possible in open areas. * WHAT...Mixed precipitation expected. Total snow accumulations of 3 to 5 inches and ice accumulations of a light glaze expected. Winds gusting as high as 35 mph. 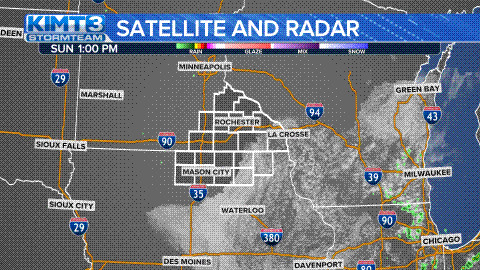 * WHERE...Wabasha, Dodge, Olmsted and Mower Counties. * ADDITIONAL DETAILS...Plan on slippery road conditions. Patchy blowing snow could reduce visibility in open areas. * WHAT...Mixed precipitation expected. Period of wintry mix Saturday morning then a period of rain into the afternoon. Snow is expected Saturday night. Total snow accumulations of 1 to 4 inches and ice accumulations of up to one tenth of an inch expected. Winds gusts in excess of 40 mph may cause significant blowing and drifting of snow Saturday night and Sunday. * WHEN...From 4 AM CST Saturday to 1 PM CDT Sunday. * WHAT...Mixed precipitation expected. Total snow accumulations of 2 to 4 inches and ice accumulations of up to one tenth of an inch expected. Winds gusting as high as 35 mph. A Winter Weather Advisory means that periods of snow, sleet or freezing rain will cause travel difficulties. Expect slippery roads and limited visibilities, and use caution while driving. The latest road conditions for Minnesota can be found at 511mn.org and for Wisconsin at 511wi.gov, or by calling 5 1 1 in either state.